Rentals coming for PSP Go? The possibility of downloadable rentals has appeared after The Retail Gamer dug into their shiny, new PSP Go. It noticed something seemingly innocuous that could well reveal what is the start of a whole new world. Upon re-sorting the PSP’s system folders, it turned out that there was only one option available, and that was to re-arrange according to expiry date. But why would downloaded games need an expiry date? Is this to let players download and play games for a few days as part of a rental service? Physical rental services such as Blockbuster are already in great decline with much of this being attributed to the increased costs involved during a recession. It makes sense that the next step is to rent games online. With services on both the PlayStation Network and Xbox Live Marketplace allowing players to download full games, and with faster broadband speeds available now, it certainly would be the most convenient option for the average gamer. Plus, with the precedent set by the PSP Go’s inability to play UMDs, the option to download games as a rental, as an alternative to purchase, would surely be welcomed by PSP Go owners. With the PSP Go’s large memory stick capacity and the 16 gigabyte internal memory, this surely makes perfect sense. It was only a few months ago when Joystiq uncovered a survey asking consumers whether they would be interested in a PSP game rental service. The survey asked whether consumers would want a set monthly fee for the service and suggested that both recent and older titles might be available through it. It’s certainly a plausible, indeed attractive concept that I’m sure would be extremely useful. As has been already been mentioned, however, the PSP and PlayStation 3 had expiry date implementation in the past, typically used for things such as beta tests. However, this doesn’t explain the market research survey. I suspect this is something that Sony may well be researching and possibly planning to implement in the future. Considering the huge amount of items put on PSN in time for the PSP Go’s launch, I suspect it won’t be any time soon as it would already be up by now. However, it may well be something that gets added later on in the PSP’s lifespan. 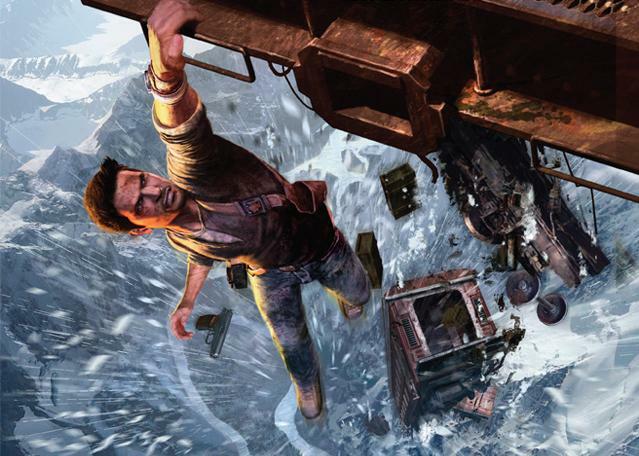 Even though Uncharted 2: Among Thieves hasn’t yet reached our PS3s, the buzz around the game and the series is huge. Naughty Dog’s Co-President Evan Wells has taken this to new levels with the announcement that he would "love to see Uncharted grow beyond the PS3". Although tht’s no confirmation, it certainly brings about an interesting possibility. Wells did point that Naughty Dog is currently purely focused on PS3 development, so we should not expect anything in the ’near future", but surely it be of great financial sense to make a new Uncharted game on the PSP? Naughty Dog has done it before with the likes of PSP title Jak and Daxter: The Lost Frontier, so it is clearly supportive of both Sony’s home console and its handheld one. Other PS3 games crossing over to the PSP have certainly been successful in the past. God of War transferred very successfully with Chains of Olympus selling 340,000 units in its first month alone. It was also successful critically with excellent review scores all round. Hot Shots Golf earned similar success when it came to the PSP in 2004. Such games have set a great precedent which must surely encourage Naughty Dog to pursue an Uncharted PSP title. However, and perhaps rightly so, the developer is waiting until such a time where it can take the focus from the increasingly stronger PS3 market. Don’t hold your breath for an Uncharted game on the PSP just yet, but here’s hoping that sometime in its lifespan it just might happen! Yet another PSP coming soon? Just when you thought consumers had enough PSP revisions to choose from, it looks like a new PSP is on its way! This time it’s the PSP-4000, which sounds suspiciously like a new Terminator model if you ask me (Not cool enough for Terminator – Ed). This rumor has come from N4G user Super_Secret who has a proven track record when it comes to Sony-based rumors, having correctly predicted a lot of the PS3 Slim’s details, such as the system doing away with the Linux OS support as well as the pressure sensitive buttons in favor of more cost-efficient push buttons. The rumor is that a new PSP model, the 4000, is on its way along with the return of the contentious UMD drive. According to the tip, the 4000’s aim is to live alongside the PSP Go, presumably as a direct replacement to the PSP 3000. The possibility of a new PSP does fit neatly into recent comments from Sony head honcho Kaz Hirai who recently denied that the PSP Go was the start of the death of physical media. No other features have been mentioned about the system which does beg the question: why bother releasing a new revision of the PSP? Something that I’m sure Sony will answer in time. Considering just how many iterations of the PSP have emerged since its launch, it does seem a little odd to me to have yet another version be released. Then again, with worldwide sales of nearly 56 million PSPs, who could blame Sony for trying to make a few more dollars out of the system? Bearing in mind the previously reliable source, I say we should expect a lovely new Sony PSP 4000 ito grace our lives n the near future.